To follow up on David Tarpy’s post (Protective Measures of Beehives During Hurricanes), in the days and weeks following Hurricane Florence, we will see mosquito spraying on some scale whether it’s done by the usual commercial applicators who sell services to the public or if it’s by municipalities and counties particularly if a public health emergency arises. No doubt everyone is preoccupied with storm preparation, but for people who have bees, taking the time to register their beehives at the NC Driftwatch site can pay off in so many ways. It only takes a few minutes to create an account and then enter the information about the location of your hives. These data allow the N.C. Department of Agriculture & Consumer Services and other agencies (and individual applicators) to know where there may be commercial bee yards as well as the numerous hobbyists or “backyard beekeepers”.across our state. Spraying for mosquitoes and protecting pollinators do not have to be mutually exclusive as long as we have lines of communication. Driftwatch is a major means for keeping everyone involved aware of what is happening. 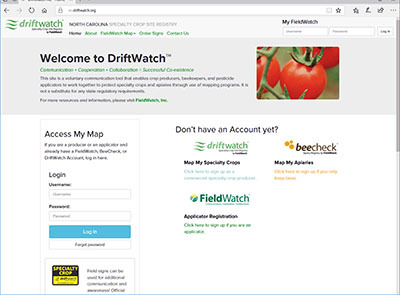 Aside from the hive registration component, Driftwatch also provides a way for commercial specialty crop producers to register their fields. Some of the pesticides used for mosquito control programs are not labeled for application to certain field crops, particularly some of the vegetables, small fruit and other specialty crops. Plus, there are a growing number of organic-certified production fields across the state. 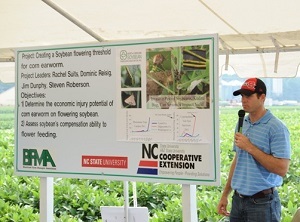 So, registering the location of current crops is helpful during the planning phase of any control programs. We encourage people to take advantage of this opportunity to help protect the public as well as our pollinators and crop production areas.